Tears aren’t always a result of sadness, they can also be a beautiful sign of release and healing. 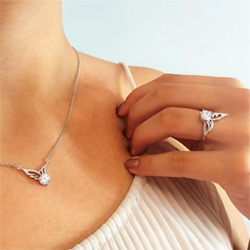 Beautifully designed with rose gold plating and a delicate angel wing featuring lavender stones, the focal feature of the necklace is the ultra-feminine and elegant pearl powder that fills the shape of the pendant, each with a unique hand-crafted pattern that sparkles and shines. The gentle lavender color invites forgiveness, healing, and confidence into your life. This necklace will be a complimentary and eye-catching addition to your collection, and it will make a cherished gift for someone special in your life.